If you don’t like cheesy posts filled with lots of love then this is not for you. In 2002 I met 3 people that I quickly came to love with my whole heart. 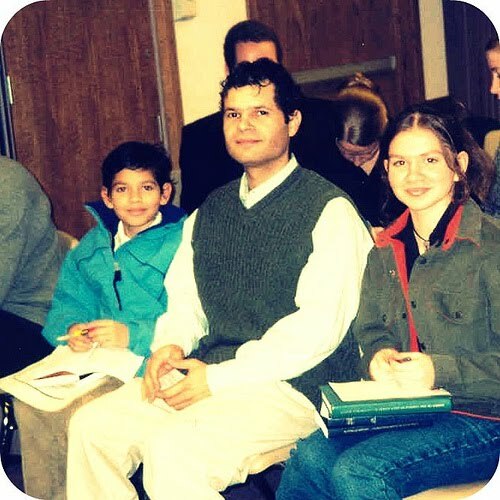 I was serving as a full time missionary for my church when I met Adalton and his two children Camila and Rodrigo. Just saying their names makes my heart swell up. I love them so. Adalton, Camila and Rodrigo had come to Minnesota from Belo Horizonte, Brazil to make a life for themselves. Adalton’s wife was supposed to follow shortly after. But then 9/11 happened and getting a visa seemed impossible. Rodrigo was 11 years old and Camila was 15 years old. I can’t even imagine how hard it was on all of them to be separated for so long but they are so brave and strong. I love this picture of them but it should have fireworks and glitter and lights and hearts and awesome music coming from it. Then maybe you’d feel what I feel for them. Yesterday, I got the sweetest news from Camila. After 9+ years of waiting, her mom has her visa. She’ll be here in a week. Perfect timing, especially since Camila is getting married in June. Here’s to answered prayers. I cannot wait to see them again and meet their mother. My heart is so full right now it’s leaking out of my eyeballs. I cannot say enough how much they mean to me. And I just have to add how special and sweet Camila is. And even though she’s several years younger than me I admire her so much. Everyone loves her. It’s impossible not to. Honestly, who cares about stolen bank cards and torrential rain when you have such wonderful news? o my gosh, I don't even know these people but I got butterflies when you said her mom got her visa and is going to make it for the wedding. this made my eyes tear up! i'm so glad it's a happy ending… thats so sweet! such a beautiful photo. an incredible story.